Best AR-15 Rifle Twist Rate: Does It Really Matter? 1:9, 1:8, or a 1:7? When it comes to AR-15 barrels…you may be noticing different rifle twists in their specs. Will the wrong weight bullet for your twist rate make it fly off into the sunset? It does matter, but I’m here to make your decision easy and help you understand what it all means. The first thing that needs to be understood is that bullet weight does not directly have anything to do with what rifle twist you should be using in your AR15 barrel chambered in 5.56 NATO or .223 Wylde. Now before some people start pounding their table, and grabbing pitchforks, let me explain. Bullet length is what ultimately dictates your barrel rifling twist. 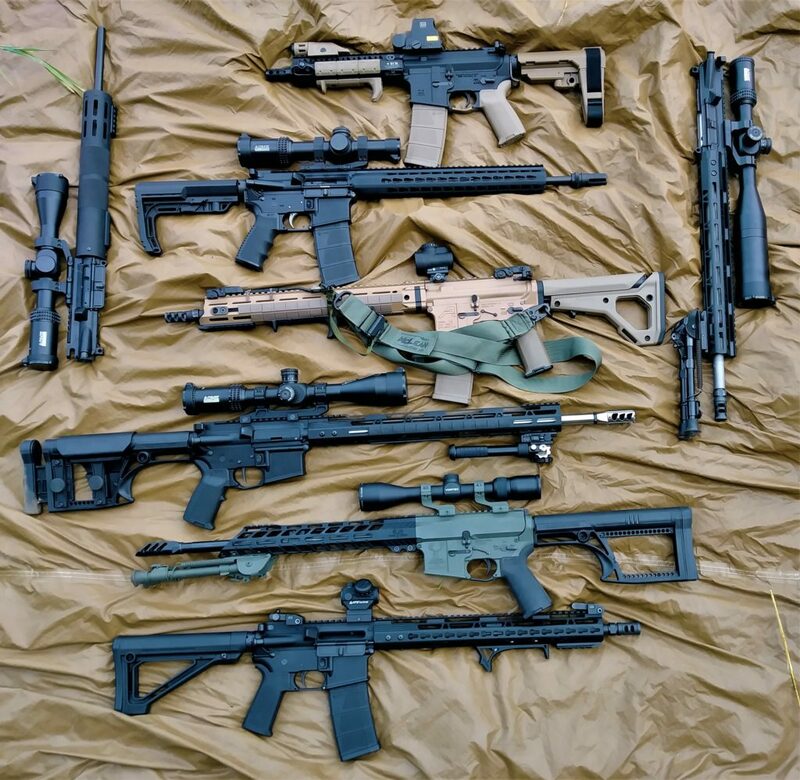 If you do a quick google image search, you will find a few different charts or graphs that specifically show bullet weight and which rifle twist you “need”. While it is a general rule of thumb with weight, in reality, the longer a bullet is, the heavier it becomes. With newer types of bullets on the market and lead-free designs, some bullets made of copper and zinc are very light but require extra length to achieve the same weight compared to a lead core projectile. So, the longer the bullet you shoot, generally speaking, the faster the rifling twist needs to be to properly stabilize the bullet in flight. With great stability comes great accuracy. But what does the barrel twist mean? In the early years of the AR15’s development, the rifling twist that was adopted was a 1:14 rifle twist. The easiest way to explain what that means is that the rifling makes a complete twist 1 time every 14″. Most loads shot through these barrels were a very short, lightweight bullet in the 40-55 grain category. You can read a more complete history of the M16, but for now, let’s fast forward to the present. The early M16A1 utilized a rifle twist rate of 1:12 to stabilize the 55 grain M193. After the adoption of the M16A2, the military started using a 1:7 rifle twist, which was faster. The rifling made a complete revolution within 7″ now instead of 14.” We are talking twice as fast. The military also adopted a longer, heavier projectile with the SS109 steel core projectiles loaded in the M855 cartridge. The current example of an M4 carbine with a twist rate of 1:7 to stabilize the 62 grain M855. So why are there multiple rifle twists on the civilian market with the 1:9, 1:8, and the 1:7 as stated before? 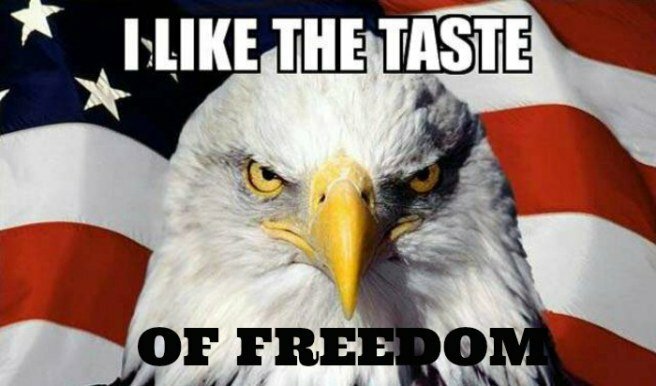 If you are a red-blooded American, you enjoy the perks of capitalism. The one drawback of capitalism though is that the market breeds more choices and more decisions. A lot of barrel manufacturers sell all of the top three rifle twists in their barrels, and it can be a little daunting when you are trying to figure out which one to get. We covered the fact that you need to properly stabilize a bullet, and we have covered a quick history of different rifle twists. Stick with me here, because I am going to make this a very easy decision for you. Out in the unnatural world of the interwebs, you can run into a lot of bad information regarding practically anything. Rifle twist and bullet choice are no different. When it comes to slower rifle twist, i.e. 1:14, 1:12, 1:9, you really shouldn’t be shooting bullet weights over 65 grains or the equivalent length for a 65-grain bullet. It won’t damage your rifle, but you will have very poor accuracy. Are bad twist rates why Stormtroopers can’t hit anything? It is absolutely true that heavier, longer bullets in the 69-85 grain flavors like faster rifle twists of 1:8, or 1:7. When someone tells you, “if you want to shoot some operator level Mk262 77 grain OTM ammo, you need a 1:7 twist”, believe that they have your best interest at heart. But what about an all-purpose twist you may ask? Maybe you are just like me, and you want a barrel twist that can excel with the heavier 77 grain or 85-grain loads, BUT at the same time you want to get out and smoke some woodchucks or prairie dogs, and you would like a 40-grain bullet to shoot accurately? Can you “over-stabilize” a lighter bullet with too fast of a rifling twist? I decided to run through a little experiment with multiple loads of .223 Remington and 5.56 NATO. Ten different loads to be exact. And to make this even more scientific, I did it with two different rifles that both have a 1:7 rifle twist. The first rifle that I tested is a home-rolled rifle that utilizes a Radical Barrels, LLC 20″ 416R stainless barrel. Rick Hoffmeyer of Radical Barrels, LLC made it for me, and it’s a fantastic barrel. The optic on this rifle is an ACME Machine 6-24x50mm FFP TR-MOA. For the price, it is hard to beat for a first-focal-plane optic. The second rifle is a factory Bushmaster Minimalist that Remington had me use on a hog hunt down in Texas at the Spike Box Ranch. (If you ever get offered a chance to go there, don’t think about it. DO IT.) The only thing I added to this rifle was an ACME Machine 1-8x28mm FFP low-powered variable optic. Glass clarity on this scope is impressive, to say the least. 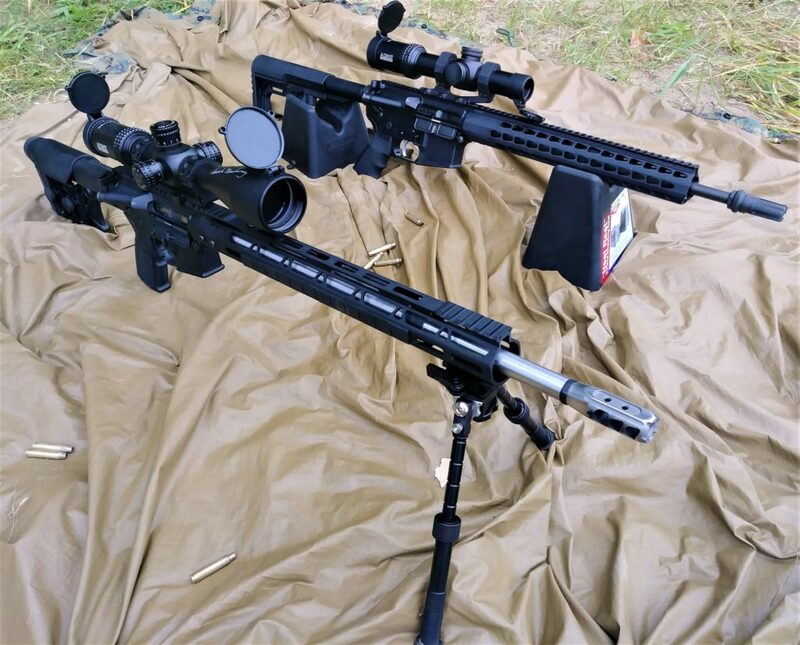 Both rifles used scope mounts from Green Blob Outdoors, and for the price, are exceptionally solid scope mounts that lock down tight. 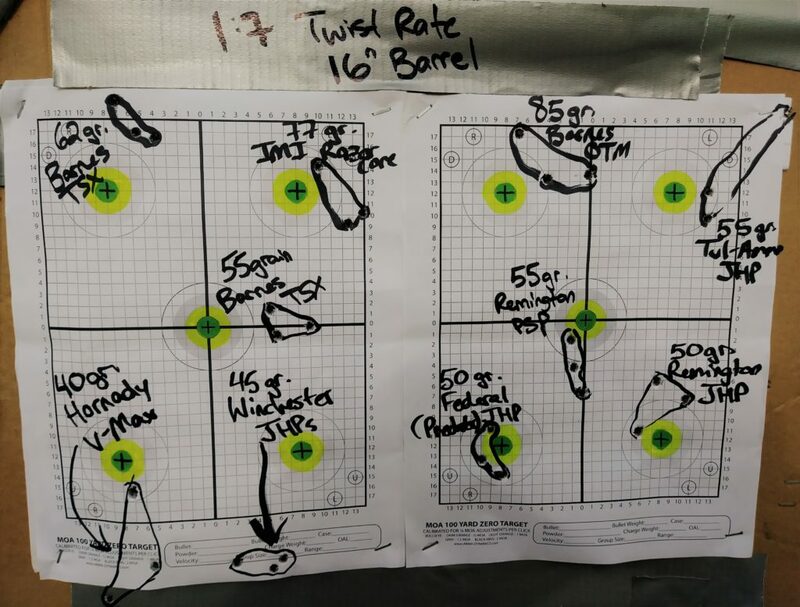 With ten different loads, all varying from the lightest/shortest to the heaviest/longest projectile that will fit inside the mag well of an AR15, I went about firing 3 round groups with each load at 100 yards to test how well each bullet would do. I fully understand that some purists may be wringing their hands in the air because I did not do 5 shot groups. I get it. When I really test accuracy for a specific load, I fire 5-10 round groups to really see its potential. 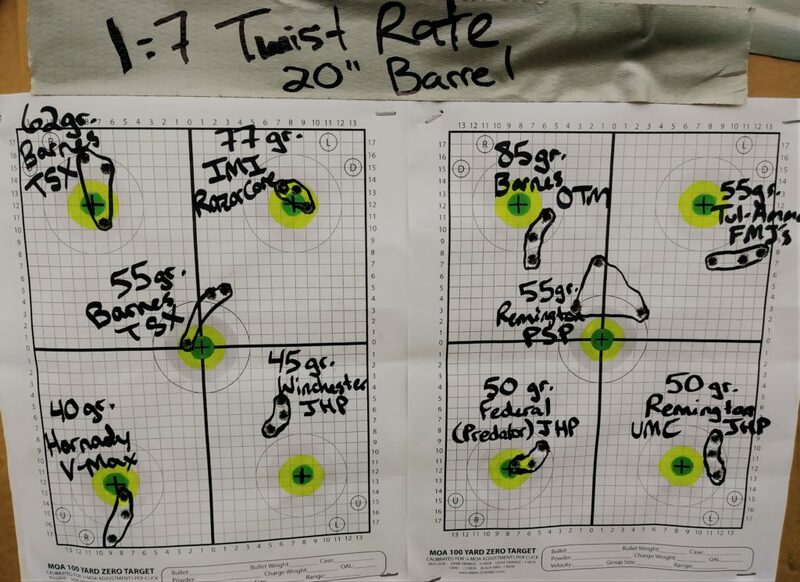 While this isn’t a comprehensive accuracy test for each load, this test shows a good representation of the accuracy potential for each load out of a 1:7 rifle twist barrel. As you can see from the included photos, there was absolutely no loss of accuracy from an “over-stabilized” lighter/shorter bullet. Both rifles tend to shoot roughly the same point of impact, varying across the whole spectrum of bullet lengths and weights at 100 yards. Some conventional “wisdom” would dictate that my accuracy should have suffered greatly with the shorter/lighter bullets with a faster 1:7 rifle twist or worst case scenario tumble through the air and keyhole the target. This just isn’t the case. Within the normal ranges that most shooters fire their rifles, bullet length and twist should not be a concern if you have a faster 1:7 rifle twist. What should be a concern though, is feeding your rifle quality ammunition, and making sure your barrel is of good quality if you are striving for accuracy. Ultimately, that is the deciding factor of accuracy when using a 1:7 rifle twist. So its time to pay the piper, and make a decision on the rifling twist that will best suit your needs as a shooter. My vote is a 1:7, hands down. With a 1:7 rifle twist, shooting quality ammo, you can go as light as you would like with commercially available ammunition. A case could be made that “over-stabilization” can bring about issues at extended ranges, but why would you honestly shoot a 40-grain projectile past 300 yards? If you are actually trying for accuracy at extended ranges of 300-700 yards, a 69-85 grain bullet is much better suited for the task at hand. For up-close shooting drills, or within 300 yards, bulk 55 grain M193 will do just fine as well out of a quality barrel when you are on a budget. Obviously, your mileage may vary, but generally speaking, if a load shoots like a dumpster fire, more than likely, your barrel just doesn’t like that specific mixture of powder weight and bullet style. In my opinion, it just makes sense to stick with a 1:7 rifle twist! And now that you know how twist rates affect you, you’ll want to know what the Best AR-15 Ammo: Home Defense & Range is for you and your rifle. What twist rate is your barrel in? 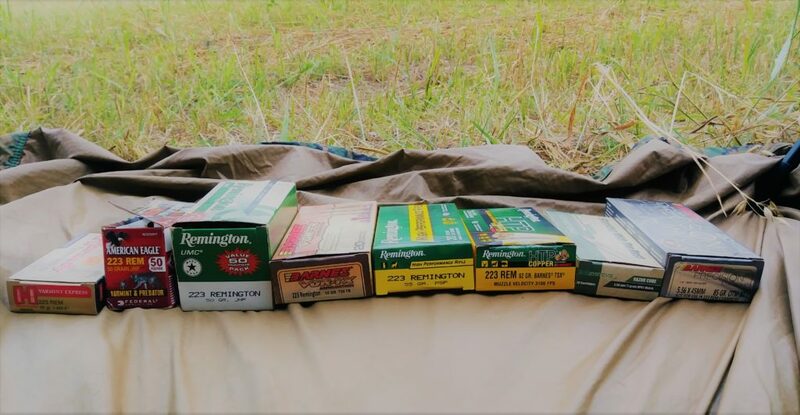 What is your favorite ammo? Let us know in the comments! I read through this article pretty quick. Did I miss or did you not mention the length of the barrel is a major determining factor along with twist rate? The first M16’s had 20+ inch barrels. Shorter barrels and longer bullets was the reason for faster twist rates. Very good read, I take it from the graph at the top a 1-8 is more or less the “Jack of all” seeing it will work well with most ammo. The one think I did see in the photo’s is that the point of impact changes with each load. Find the one you tube likes and stick with it. I was actually expecting a larger point of impact change from each type of bullet, but there was a definite change. And that is to be expected. But accuracy wise, most of the loads were more than reasonable in accuracy in my opinion. And a 1:8 is a solid choice, but I still prefer the 1:7.